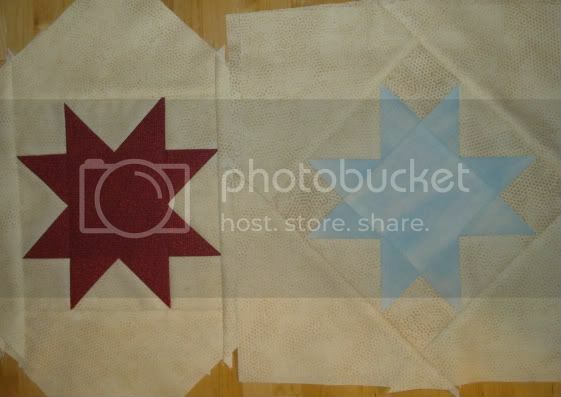 Quilts of Valor "Just One Star"
I don't follow instructions - I made four "just one star" blocks. One for my husband (an Air Force pilot), one for our friends and family currently serving, one in memory of those who have passed on, and one for my husband's cousin, who was wounded in Afghanistan in August 2010. It's close to the deadline, but not too late to whip together your star and send it off! 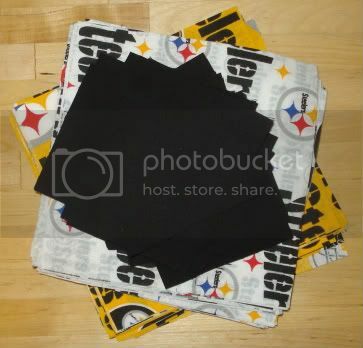 Steelers Quilt - I cut all the remaining blocks this morning so I'd have an accessible leader/enders project (and won't be tempted to start another.) Final count will be ten 10" finished blocks in each color. iSpy Sliced Coin Quilt: cut about five more novelty prints. I should really get around to counting what I have. Knitting bag and pattern holder for my sister. Fabric is here!